Temperature : Max. 37°C and Min. 26°C in Summer. Max. 29° C and Min 20° C in Winter. Tiruchirappalli or Trichy is situated on the banks of the river Cauvery. 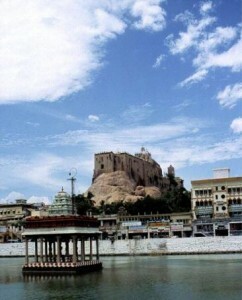 Tiruchirappalli is known for its rock fort and its temple at a height of over 83 mts. Other renowned temples are, the Sri Ranganathaswamy Temple, Shiva Temple at Tiruvanaikkaval and the Samayapuram Mariamman Temple. Worthwhile excursions include Nartamalai, Sittannavasal, Kudumiyanmalai, and Kodumbalur, which are famous for their ancient monuments, Jain Caves with intricate wall paintings. Tiruchirappalli is fine picnic spot also. Air: Trichy is connected by Indian Airlines flight to Chennai. Rail: Trichy is an important railway station connectd with all the major places of India. Road: Trichy is connected by regular buses to Chennai, Coimbatore, Chidamvaram, Knyanakumari, Rameswaram, Madurai, Thanjavur, Ooty, Pallani and Bangalore. This entry was posted in Tamil Nadu, Tiruchchirappalli. Bookmark the permalink.